The Oculus Go is finally officially available, and is an excellent mobile virtual reality headset. 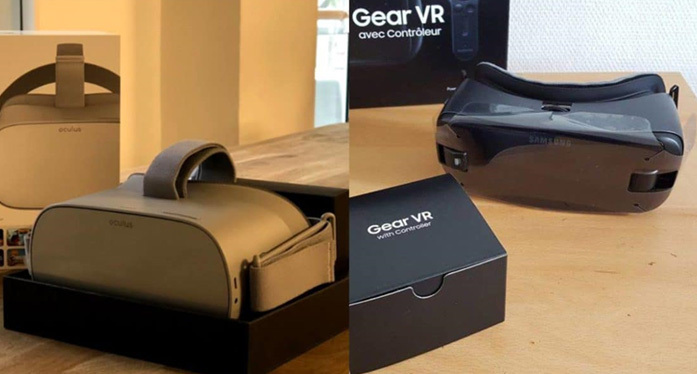 Therefore, a comparison is needed with the device that severed as a reference in the mobile VR headsets market so far: the Samsung Gear VR. What are the differences between these two devices, and which is the best? Answer in detail. The Oculus Go, launched as part of the Facebook F8 conference of May 1, 2018, has established itself as one of the best mobile VR headset. Discover what this device is worth against the Samsung Gear VR. Let’s start with the design first. The Oculus Go has dimensions of 190x105x115mm for a weight of 467 grams. The Samsung Gear VR, meanwhile, measures 207x120x99 mm and weighs 345 grams. Despite its more compact dimensions, the Go is heavier than the Gear VR. This is not really surprising, since this new headset embeds all the components necessary for its operation. The Gear VR meanwhile draws all its power from the components of the Samsung smartphone inserted in the slot provided for this purpose. It is therefore necessary to add the weight of the on-board phone by the Gear VR. For example, the Galaxy S6 weighs 138 grams. The total weight is therefore more than 480 grams. In terms of aesthetics, it is difficult to establish an objective judgment. Everyone has to choose the headset he finds the most beautiful. Even if the Oculus Go is very aesthetically successful, we must recognize that Samsung has refined the design of its device over the different versions. Anyway, these two headsets are meant to cover your eyes. The design is not the most important criterion to be considered for the tie. The real major difference between the Gear VR and the Go: connectivity. The latter does not need to be connected to a smartphone to work. Just put it on his head to get into VR, which greatly increases the ease of use and comfort of the experience. The performance of the Samsung Gear VR depends entirely on the smartphone to which it is coupled. The device is compatible with the Samsung Galaxy Note 5 and Note 7, S6, S7, S8, S9 (and their respective Edge / + versions) and with the Galaxy A8 and A8 +. The oldest is Note 5, and the most recent is the S9 +. For its part, the Go embeds a Qualcomm Snapdragon 821 processor. It therefore offers performance comparable to that of a Gear VR equipped with a Galaxy S7. Logically, a Gear VR associated with a Galaxy S9 and its Snapdragon 845 processor will be significantly more powerful. However, the applications available on these two devices are designed to work optimally even with a Snapdragon 821. For the rest, the two devices have several common points: they have a MicroSD port to expand their storage space. They connect to the internet through WiFi. 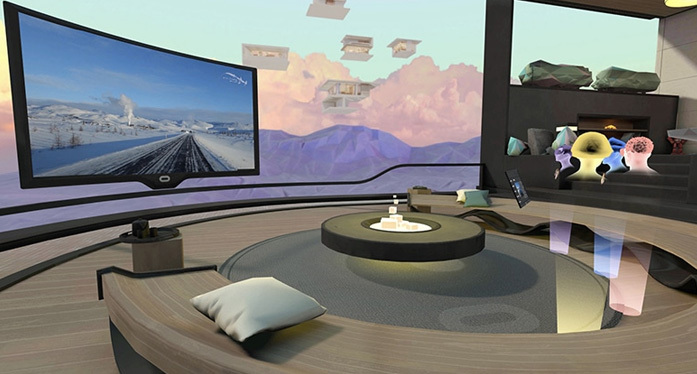 Note that only the Gear VR is able to connect via mobile networks. However, you can share your connection to enjoy the Internet on the Go. Both are provided with a single controller to interact in the VR. Another common point between these two headsets is their motion tracking system with 3 degrees of freedom. Both devices embark a gyroscope, an accelerometer and a magnetometer to track the movements of the user. These components make it possible to follow the rotations and head movements of the user, but not the movements of the rest of his body. The screen definition of Samsung Gear VR again depends on the smartphone to which it is associated. However, its maximum definition is limited to 2880 × 1440 pixels, for a refresh rate of 60Hz and a field of view of 101 degrees. 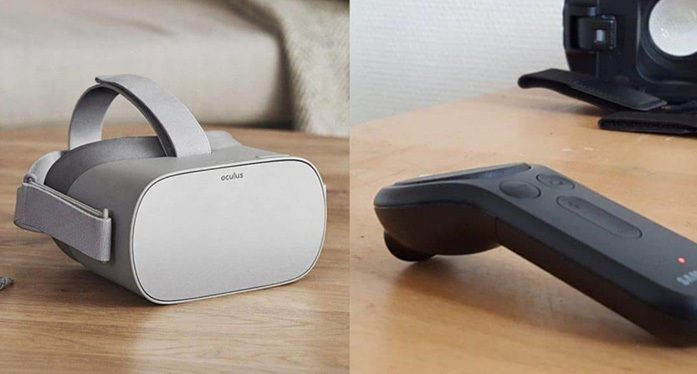 The Oculus Go on its side is equipped with its own 5.5 inch screen, and offers a definition of 2560 × 1440 (WQHD) for a refresh rate of 72 Hz. In terms of screen definition, the Gear l ‘ therefore, but the Go offers a better refresh rate. In terms of audio quality, the Oculus Go also stands out from the Gear VR. Samsung’s headset delivers sound through the smartphone it ships. It is obviously possible to connect earphones in the phone, and control the volume via the touchpad or the controller. The Go, meanwhile, has its own system of integrated speakers to deliver a spatialized sound directly in the ears of the user. A 3.5mm jack is also available for headphone connection, and an integrated microphone allows communication during online experiments. For the software part, there is not really to separate these two VR headsets since they operate on the same platform. Indeed, Samsung has developed the Gear VR in partnership with Oculus. This device runs on a mobile version of the Rift software platform. The Oculus Go ships the same platform, and also offers the same catalog of games and applications Oculus Store. All Gear VR applications and games are Go-compatible, allowing users to enjoy a catalog of more than 1000 titles as soon as the device is launched. In addition, there are more than 100 exclusive Oculus Go applications. This gives a significant advantage to Facebook’s new stand-alone headset. The main selection criterion to take into account is of course the price. The Samsung Gear VR (latest model) is currently $129, while the Oculus Go is available for $199 in 32GB version of internal storage, and $249 for the 64GB version. Gear VR versions dedicated to the Galaxy S6 and S7 cost $39.95 on Amazon on April 10, 2019. However, to operate the Samsung Gear VR, you will need a Samsung smartphone. The cheapest compatible phone is the Galaxy Note 5, which can be found new for around $203.44. At a minimum, you will need $402 to use the Gear VR. Unless you already have a Galaxy smartphone, the Oculus Go is much more affordable. Unveiled during the Oculus Connect 5 keynote, the Oculus Quest is the future of autonomous VR headsets. Facebook is launching a new generation of products halfway between Go and Rift. The first difference with the model manufactured by Xiaomi and Quest is the use of Oculus Touch. This version of the controllers previously associated with the fixed headset makes it possible to obtain a safer gesture. The remote controls of the GO and the Gear VR are pale. In this sense, Mark Zuckerberg’s company also relies on freedom of movement thanks to four onboard sensors. The Oculus Quest allows you to move in six directions, against three for the Go and the Gear VR. In addition, the Quest benefits from Oculus Insight technology. Thanks to a tracking system based on embedded cameras, the player can move at will in his house. He also files virtual protection barriers if he does not want to bump around. However, it cannot be used outdoors. On paper, this mobile headset is even better than the Rift and the HTC Vive in terms of freedom of action. In terms of resolution, it displays 1600 × 1440 pixels per eye. Which is significantly better than the single screen of the other two products. Above all, the pupillary distance can be managed from an adjustment wheel. Like the Oculus GO, the Quest has built-in speakers. This time, the storage space will be 64GB. However, the new headset does not have the most advanced processor. I ship a Qualcomm Snapdragon 835, a SoC dating from 2017 which team including the Samsung Galaxy S8. It is however more powerful than the Snapdragon 821 GO. 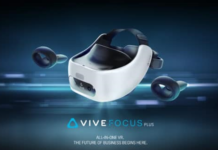 The fact that the processor only manages the VR gives it a certain advantage over a smartphone of the same generation that operates applications in the background. Unfortunately, this power gain results in the addition of a possibly noisy fan. We will see soon if this device causes discomfort. At launch, the game catalog for the Quest will actually be weaker. However, it allows to take advantage of 50 applications already available on the Rift. The superior quality of the content makes it the ultimate standalone headset. Big highlight for the Samsung Gear VR and the GO, their price. 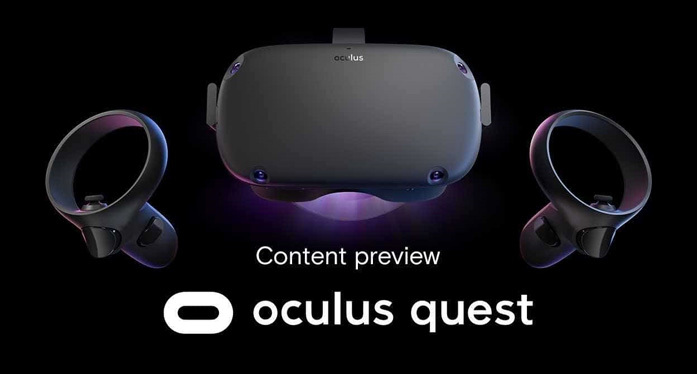 Indeed, the Oculus Quest will be sold $399 very soon. It’s almost twice as much as the GO and as much as the Rift. Nevertheless, the experience he offers shows that Facebook understands what a new generation is. 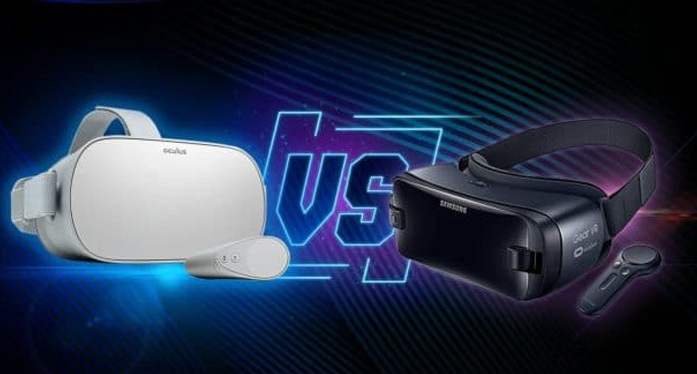 Oculus Go vs Samsung Gear VR - What are the differences between these two VR Headset, and which is the best? Find the answer in this article.